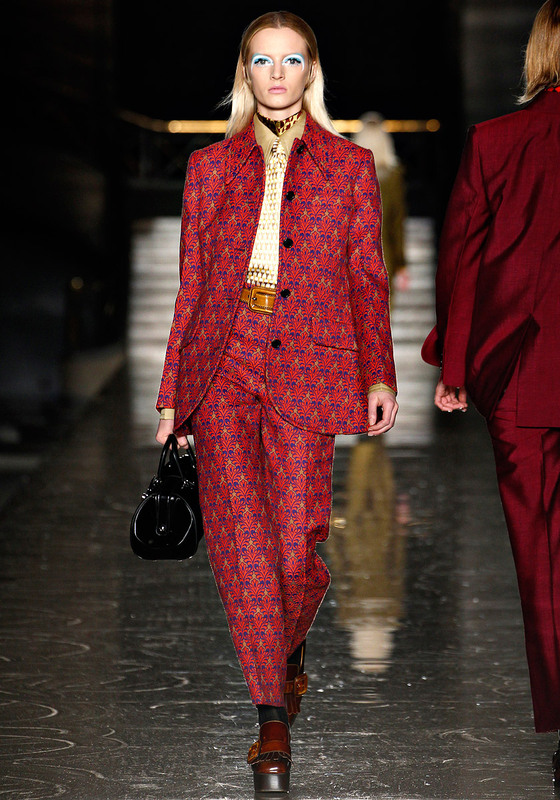 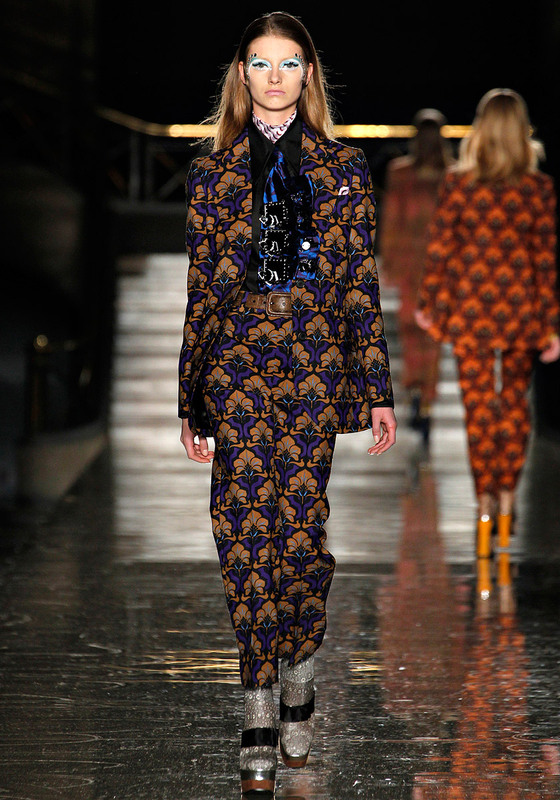 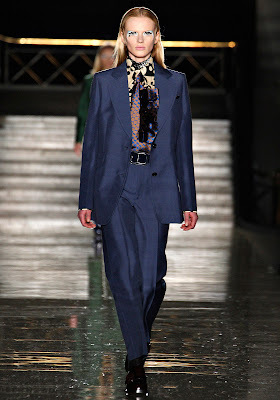 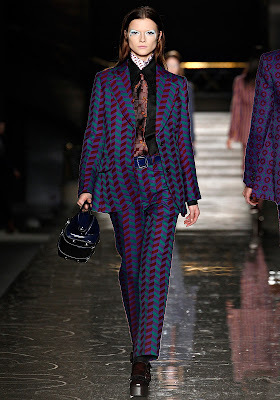 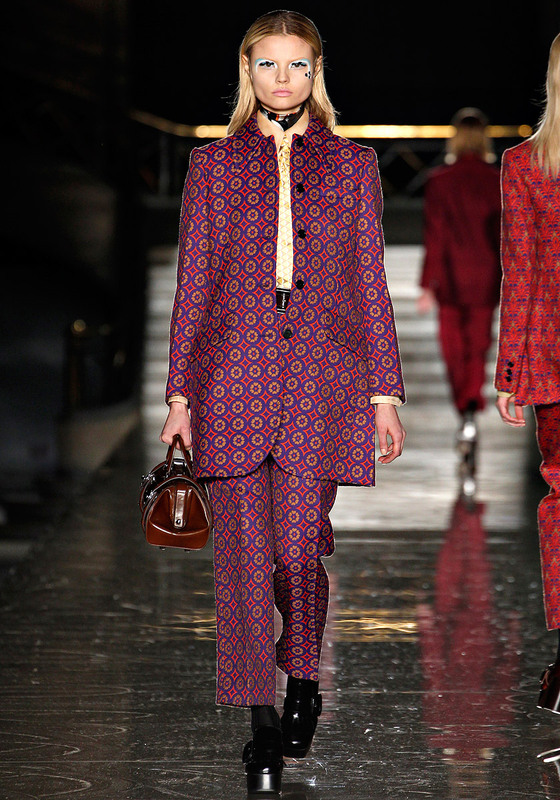 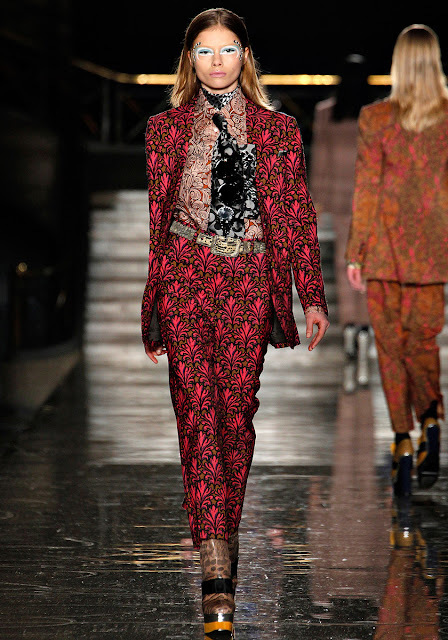 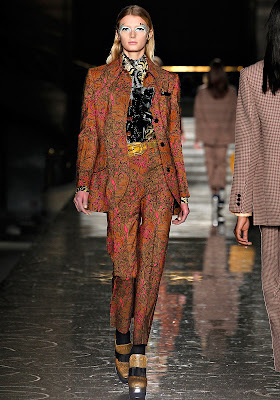 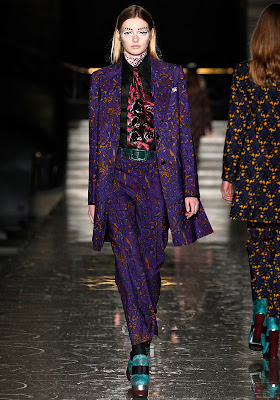 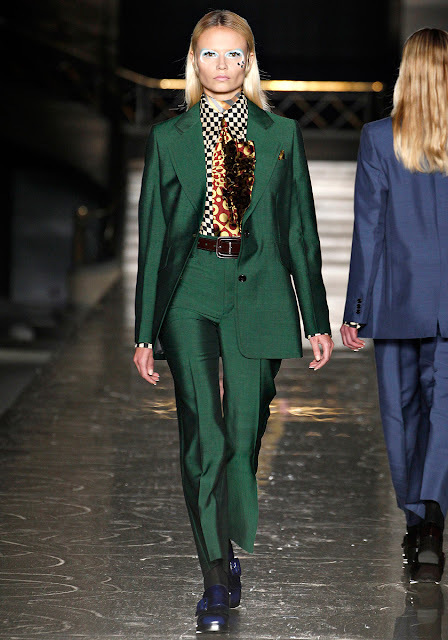 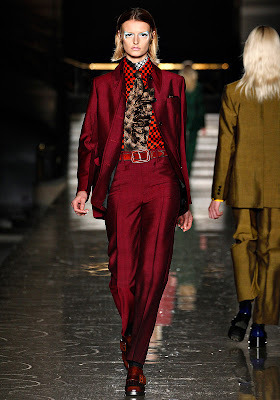 This season's collection is showered with mansuits and pants, in bold, extremely bold and eccentric pattern. 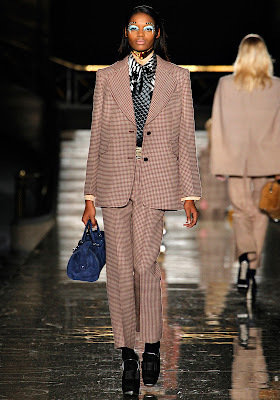 The suits are purposely tailored to be oversized, paired together with freshly-ironed pants that are a bit too short. 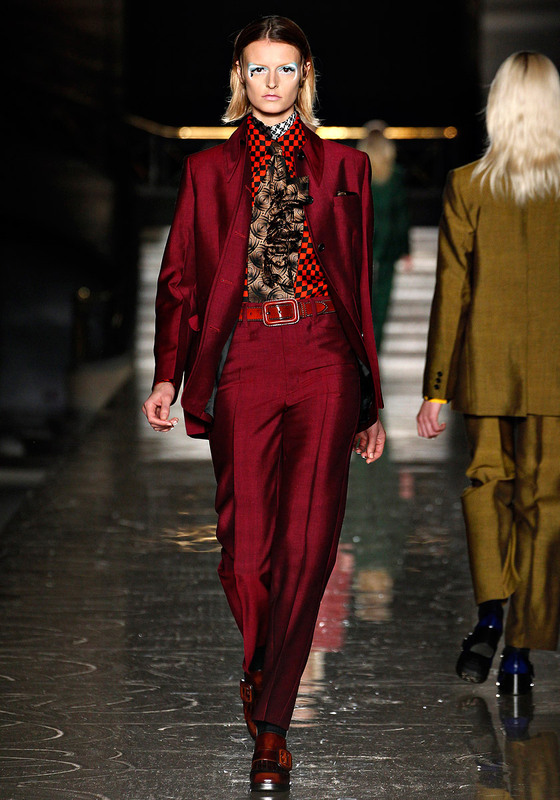 Remind me a lot of Austin Powers and the seventies. 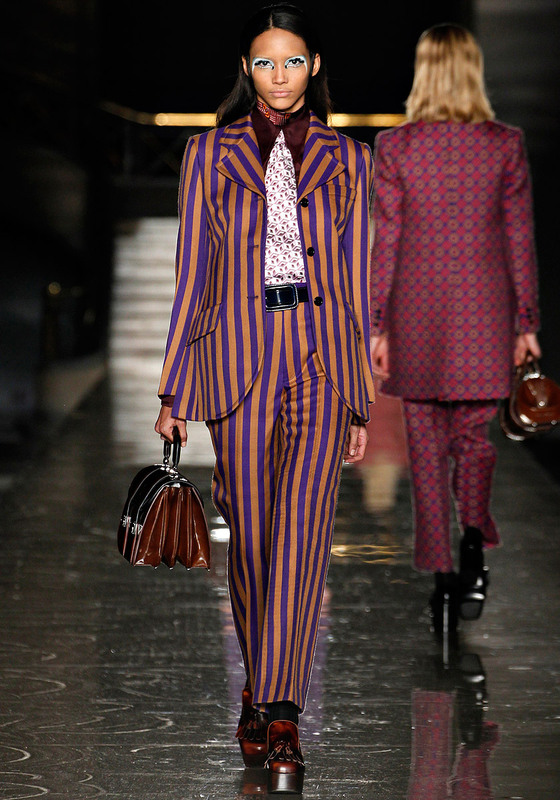 Classic and dandy. 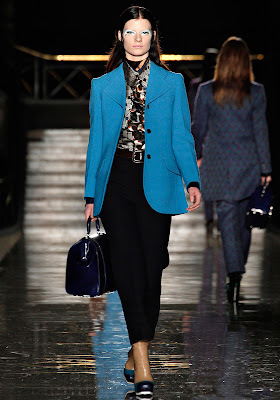 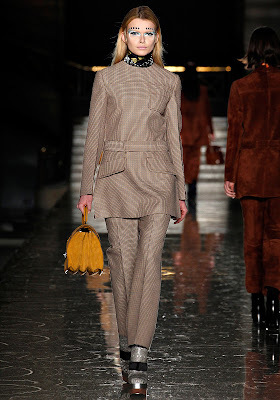 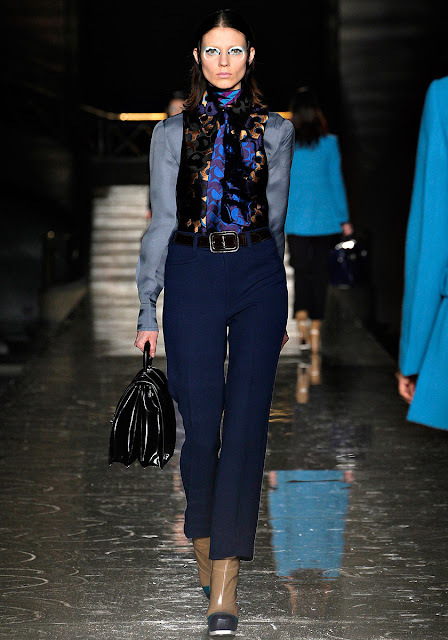 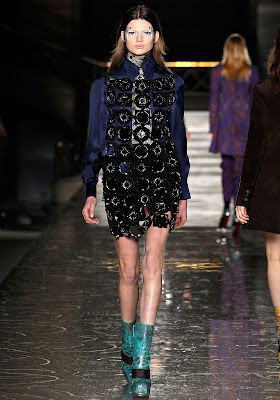 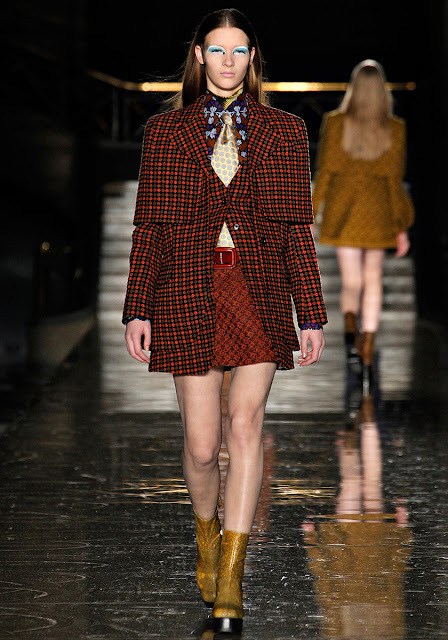 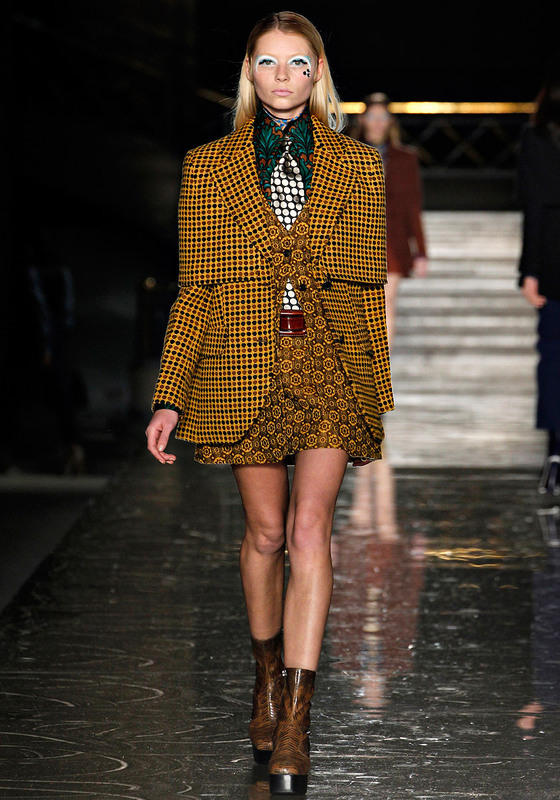 Miuccia Prada is renowned for her obsession with pants and this runway clearly shows us how she does it. 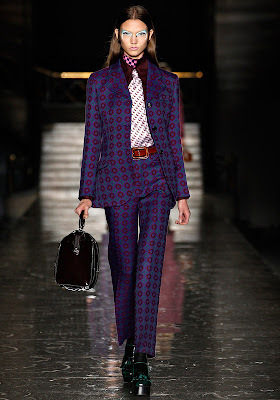 What I really love is the shirts, with its incredible pattern and eye-catching details of the tie accessories. 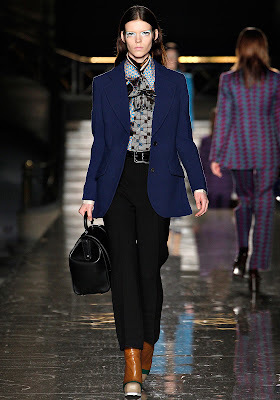 The collars and the inside scarves are also exquisite. She's so brilliant to be able to combine these many layers and geometrical patterns and make them work. 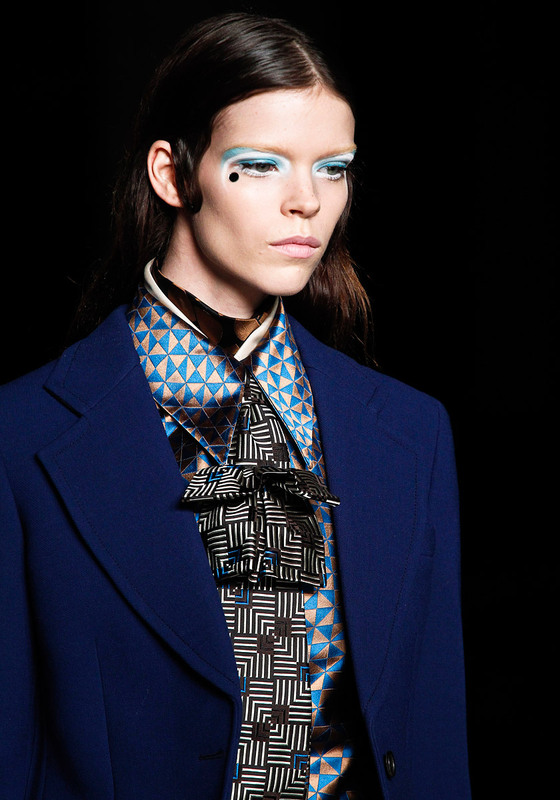 The gorgeous ruffle details of the tie accessory. 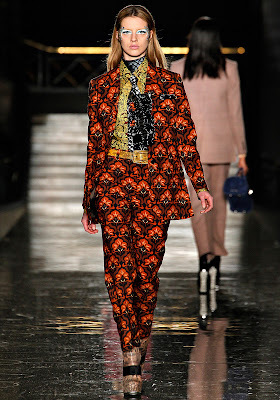 Isn't it amazing?? 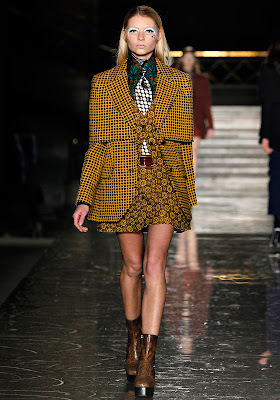 Skirt is hidden beneath an extremely oversize jacket with similar or longer length than the skirt itself. 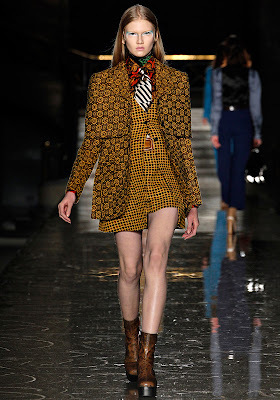 Still revealing those pair of fabulous legs. 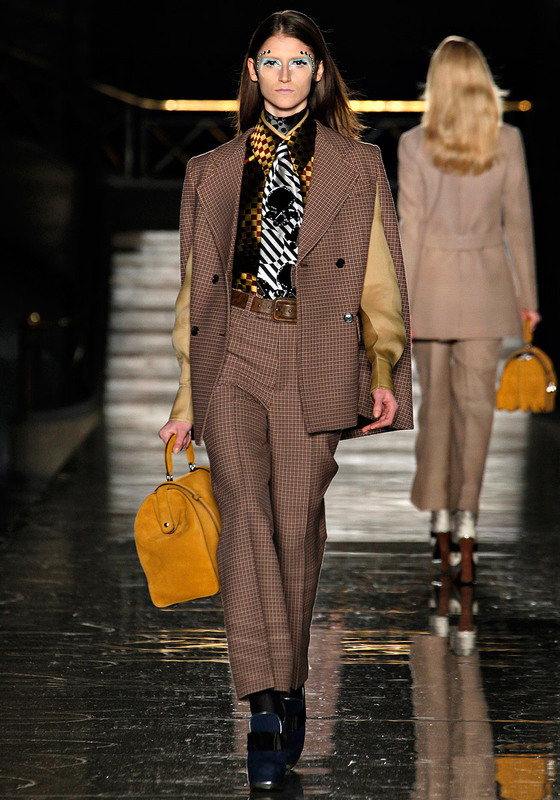 The yellow mustard ensemble really give off a Sherlock-ian aura. It looks like one of the cape he would normally wear at that time period. Just need to add his famous hat and pipe to complete the look, if you're interested. 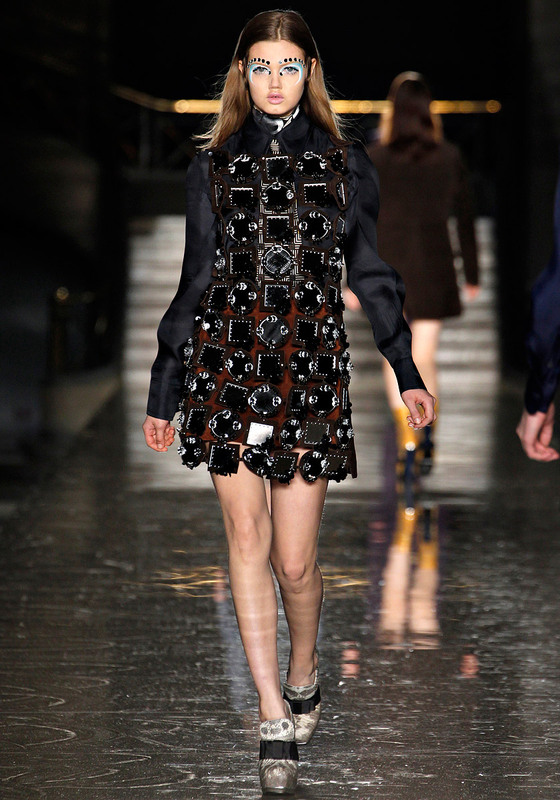 If I'm not mistaken, the black round things are actually reflective sequin discs with the size of hand mirrors.